OK – so you’ve survived the holidays and if you’re like millions of other Americans, you might now be wondering how you’re going to cover those credit card payments that are surely already on their way. There are sure to be late payments for many folks and in fact, the recession probably introduced many to the discomfort of a missed payment or two. How late you are matters. 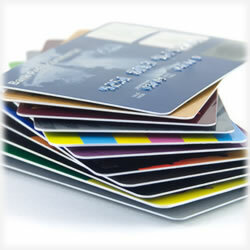 It determines how aggressive your credit card company will be as it seeks to collect its money. Whether you’re a week late or are waiting for papers to be served, here’s what you can reasonably expect wherever you are in the cycle – and what you should be doing to lessen the discomfort while covering the bases. So the payment was due on the 15th and it’s now the 21st – and you’re still a week away from payday. Odds are, your card company has already attempted to contact you. Instead of screening your phone calls, it’s in your best interest to take the call and honestly explain the situation. At this point, you’re not yet 30 days late, so you may be hit with a late fee, but odds are, it’s not going to be reported to the credit bureaus until and unless you pass that 30 day late payment. When you make payment arrangements, be sure to follow through. While this is a bit nerve-wracking, it’s not yet a major catastrophe. This is where things become more uncomfortable. Your late payment is sure to be reported to the credit bureaus, which will almost certainly bring your credit scores down and the collections calls will really begin to increase. While you’re still likely to discover the card company’s eagerness to resolve it, there’s a good chance they’re not going to be quite as accommodating as before. Again, it’s important to not ignore the calls and when you do make arrangements, stick to them. Late fees will apply and if there’s any legal way for the card company to increase your APR, it will likely do so. If you’re going through difficult times and simply don’t know when you can make your payments, tell the creditor. Honesty is always best. Your credit card company may have a program that will allow you to work out much lower payments or possibly even temporarily suspend your interest. Your account has likely been closed by the credit card company at this point. Your credit scores have surely taken a hit and it might be that steps are being made to either turn your account over to a third part collection agency or it could be that you find yourself being sued; either way, your only way to avoid those two scenarios is to pay the balance in full. Remember, too that late fees have been piling up – and interest is being charged on those fees. What might have been a $2,000 balance could easily be double that by now. Still, your best bet is to address it as soon as possible – the sooner you do, the better you’ll rest at night; not to mention you can still avoid a lawsuit. Your phone is likely ringing non-stop and the letters have become quite intimidating – take action immediately and put it behind you. Here’s the thing: collection agencies and lawsuits are burdensome, expensive and embarrassing. If the creditor writes the debt off, you’re still facing a tough time with future efforts of a car loan, mortgage or new credit card offers. At this point, the creditor may be willing to accept a settlement. This will still affect your credit rating, but at least you’re not facing those annoying phone calls from collection agencies nor do you have to worry about being served papers. At this point, you’ll want to see if you can negotiate that settlement. It’s really your only option at this point. Finally, keep in mind that you’re not alone – these scenarios are playing out every day across the nation. Of course, this isn’t ideal and it’s a club you don’t want to be a member of, but the point is, your credit card company has procedures in place that will help them collect the debt by helping you find the right solutions. Take advantage of it – it’s your financial future, after all.